We generally speak of the diameter running between 5/32″ and 3/16″ or 3.96mm and 4.76mm. There is no “exact” requirement by the US Military and since the cord will compress, it is difficult to pin-down an absolute diameter. All mil-spec paracord has a “minimum stretch” of 30%. Paracord is designed for parachutes and must have some stretch built-in for the sudden loads it is expected to endure. Military Specifications [Require] that our cord stretch is “at least 30%”. TOUGH-GRID® paracord has (11) inner strands, all of which are triple-ply, 100% nylon threads. 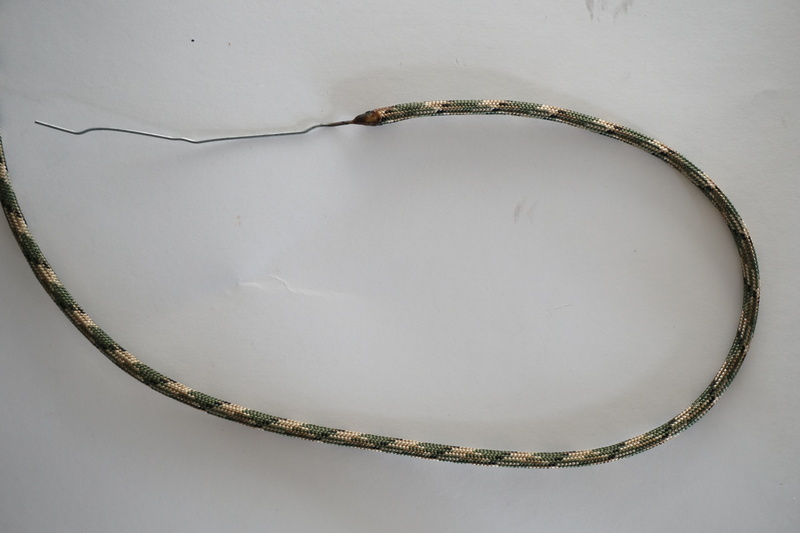 There is also a marker strand that is made of (2) black and (1) tan strand which is used by the military to identify the origin of the parachute cord. There is a range at which our 750lb Type 4 Mil Spec cord fails/breaks. Generally speaking… that is somewhere between 760 and 820+ pounds. Why the range? Well, even though we ONLY sell Mil-Spec cord, there are still slight variations in the yarns. In reality… no two cords are ever identical due to variations in the nylon manufacturing process. That said; our cord always exceeds the 750lb minimum break strength. It sure can and many of our customers use it for hammocks without any problems whatsoever. We use it for our hammocks as well. That said; the cord has 30% stretch built-in (required by the US Military) so you may need to re-tighten a time or two as you work-out the stretch over time. Another way to account for the stretch is to use more lines to slow the stretching process. Only use paracord for climbing or descending in emergencies IF you have no other choice of a better climbing rope. While our cord is excellent and considered a great “emergency supply”, it is not intended to be a climbing rope… even though many have used paracord for such in emergencies. There are thousands of uses for paracord, but one should be prudent and cautious if life & limb are on the line. All of the 750lb Mil-Spec Paracord we sell meets the requirements of the Mil-C-5040H Type IV specifications, however, not all colors are purchased and/or used by the United States Military. Our 700lb Hybrid Mil-Spec Reflective Paracord is manufactured exactly the same as our 750lb Mil-Spec Paracord, but with two reflective strands braided into the sheath. This makes our reflective paracord non-mil-spec (like all reflective paracord for obvious tactical reasons). Our 50, 100, and 150 foot lengths all come loosely coiled in sealed bags while the 200 footers come spooled on a tube and 500 and 1000 footers come coiled on a spool. Yes, the Mil Spec REQUIRES that all our TYPE 4 Parachute Cord be UV and Abrasion Resistant (Mil-C-5040H). 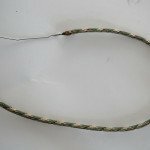 That said, all cordage will deteriorate over time in harsh sunlight, whipping winds, rubbing on tree bark, etc. 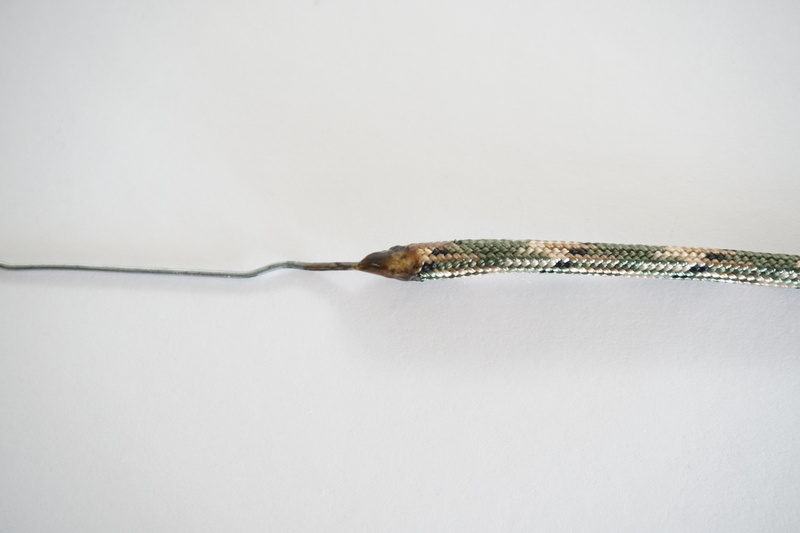 Our cord will outlast any other paracord, but may need occasional replacement if subjected to very harsh conditions. You may also need to re-tighten it a time or two while working-out the built-in stretch. Absolutely. Many of our customers have spoken of their bracelet, rifle sling, or other projects they’ve made with our 750lb paracord. 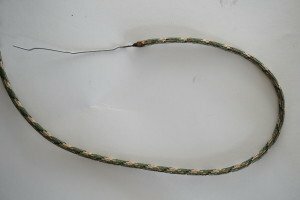 It can be a great upgrade from 550lb paracord as there are 11 inner strands that are very useful in survival situations. Keep in mind, 750 paracord is a bit thicker than 550 cord and may be a little bulky for more ~dainty projects. Yes, our paracord is pre-shrunk as required by the US Military to meet their standards. 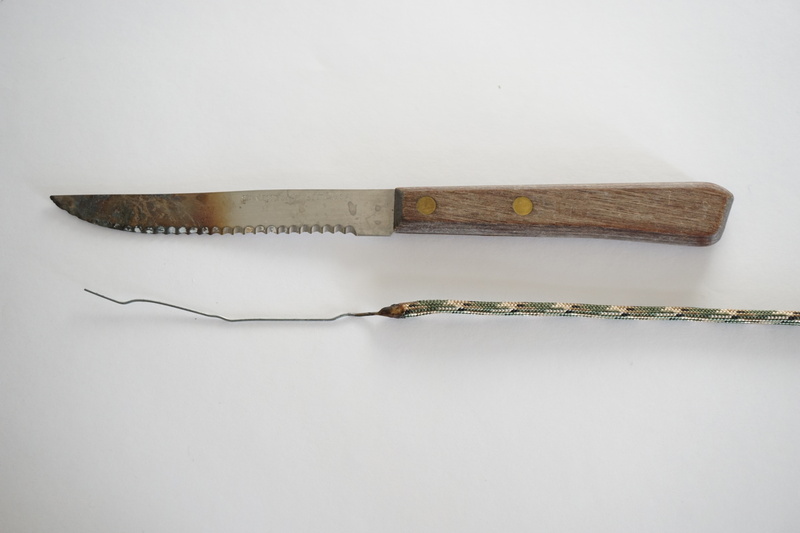 We have personally tried boiling sections of paracord and measuring the length before and after to see if there was any stretch or shrinkage. We couldn’t measure any difference between the cord before and after extensive boiling, which is a common method for shrinking paracord. We don’t splice our Paracord anywhere. That said; our 1000 Footers “May come in up-to two non-spliced sections.” It sometimes happens, but we avoid it the best we can. A high percentage of the time, it is a full 1000 feet continuous. That said; we never use more than two non-spliced lengths and don’t go below 300Ft. for the shortest length if two are used. The reason some spools have two sections is that they come from “master spools.” The master spools are only 3000 feet long themselves, but lets say a defect or a “temporary manufacturing splice” was found somewhere in the last 1000 feet of the master spool while winding a 1000 footer from it… rather than start over and rewind the (up to 700Ft.) on to some other spools or hanks (lots of time and money re-handling it) the manufacturing team just adds another 300Ft.+ to fill the remainder of the spool. We could guarantee 1000Ft. continuous but would incur a lot of machine downtime and expense in the process. Along with that… we find that 99%+ of our customers really don’t care if it is continuous as they just cut multiple sections out of it anyway. We try to keep the cord cost as low as we can and this is one of the ways we do it. Just so you know… the 50, 100, 200 and 500 footers are always guaranteed continuous. Our shipping weights (plus whatever additional packaging is used) are: 50Ft. (5.1 Oz.) – 100Ft. (9.2 Oz.) – 200Ft. (18 Oz.) – 500 Ft. (44 Oz.) – 1000Ft. (87 Oz.) and our 150Ft. “USA Tri-Pack” and “Camo Tri-Pack” weigh (15.3 Oz.). Yes, some of our paracord colors actually start-out a little bit stiffer than others but become (pretty much) equally pliable with use and time. Our Red cord starts out a little stiffer than any other color but soon becomes very flexible. Our White cord, on the other hand, is very soft right off-the-bat. This leads us to believe that the dyes used in the sheathing must be responsible for the initial difference. Since the inner (11) “Triple-Strands” are never dyed, this seems to be the only logical conclusion. Yes, but keep in mind, mil spec paracord is required by the U.S. Military to have at least 30% stretch built-in. So, when hanging bear bags or hammocks etc., it helps to either double or triple the line OR re-tighten it after the stretch is pretty much worked-out from it. The cord is actually made for parachutes and has to be able to stretch so it doesn’t break under the sudden load of a parachute opening. Our 750 Mil Spec cord is actually used for cargo parachutes and that is why it is extra tough. Definitely. Clothesline is generally 3/16 – 1/4 inch and our paracord is anywhere between 5/32 and 3/16 inch. Our cord is much stronger than clothesline and if your clips will clamp tight, it will certainly work. Due to the Mil Spec stretch requirements, you may need to re-tighten a time or two to keep your clothesline taut, especially over a long stretch. Because our cord is built for parachutes, it has 30%+ stretch built-in to it. If it suddenly had to take the full load of a person falling from a swing, it would stretch quite a bit first… maybe even more than you’d want it to. That may cause a problem or endanger people. I’d recommend a primary rope that had little or no stretch to it. 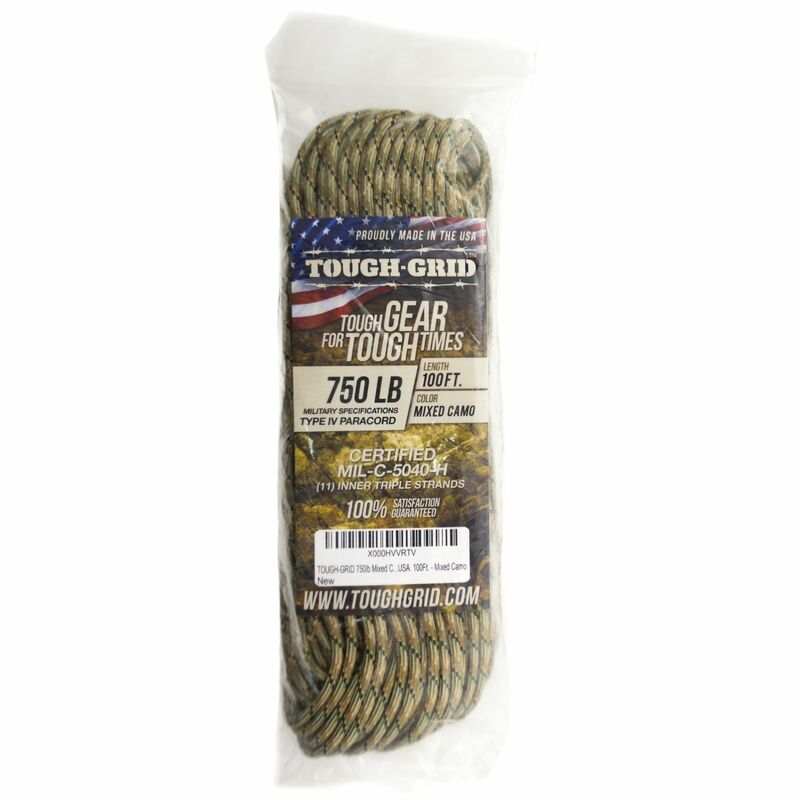 (Consider TOUGH-GRID® Ultra-Cord with an amazingly-low 3% stretch and 5,000lb Avg. breaking strength.) If you want to use paracord for your backup rope, we would suggest braiding a multi-strand rope with 3 or more lengths of paracord. By default, our products will be packed together to minimize your shipping costs where possible. Where we run into issues is when some cord is in California, but we don’t have the other color(s) or length(s) you want at the same warehouse in California, but it is sitting in i.e. Pennsylvania. That actually happens quite often because we are doing our best to guarantee same day or second day shipping for so many orders. That is the reason our cord is housed in many different warehouses across the United States. If all the cord you order comes from the same warehouse, you will more than likely get combined shipping. Ropes, cords, cables, and chains, have a working load limit of somewhere between 15% and 25% of their maximum weight limit. You should not confuse the “Working Load Limit” with the “Breaking Strength” of the paracord. The “Breaking Strength” or “Tensile Strength” is the average force at which the cord would break if in new and unused conditions when a load is applied in direct line to the cord at a uniform rate of speed on a standard pull testing machine. This is a minimum of 750lbs all the way up to 820+lbs for our paracord. Unfortunately, we don’t sell our paracord internationally, but do hope to sell internationally someday. Yes, the sheath is 100% nylon, as are the inner strands. We have a “Certificate of Compliance” to prove this cord meets the Mil-C-5040H Specs. All 750 paracord will take longer to melt than 550 paracord. This is because of the amount of material that needs to be melted. 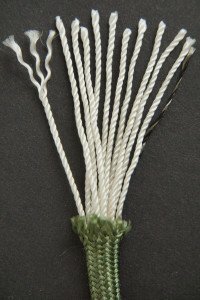 Our cord has (11) inner triple strands, while most 550 cord has (7) or (8) inner double or triple strands. We recommend using a red-hot knife instead of a flame for creating cleaner cuts/melts and for tapering ends if needed for threading into boot eyelets, etc. We have also noticed that some colors melt easier than others. That can only be related to the dyes used in manufacturing as all our paracord is 100% Nylon and nothing else. Everywhere we sell our paracord, there are images that show what the paracord will be packaged like. We ship the 50 and 100 foot lengths coiled into a hank and placed in a bag. The 150Ft. Tri-Packs are (3) 50 foot hanks put into a bag. The 200 footers are shrink-wrapped on a tube. The 500 & 1000 footers are shrink-wrapped on a spool. If you click on the small thumbnails of these images, it will display the image in a larger format so you can examine more closely and see additional images. We use something called FBA or “Fulfillment by Amazon” to complete all of our orders. This means we ship our paracord to Amazon warehouses all over the United States and they ship our cord to customers from there. Amazon does this to try and make sure people can get 1 or 2 day shipping. If a customer orders some Royal Blue Paracord in California, but we only have Royal Blue Paracord in Florida, it is much harder for them to offer or achieve 1 or 2 day shipping. Amazon is extremely good at shipping with more than 99%+ on-time delivery. If you ever have an issue with a shipment, please let us know. Our red paracord is dyed to the color that the United States Military purchases. It is a fairly “deep red” which a lot of people really like. It is impossible to show “exact” colors online. People are visiting via PC, Mac, Tablet, Phones, etc. and no two screens display colors the same way… as far as that goes, no two eyeballs see them the same way either. 😉 If you really “must have” a certain color, we recommend you buy a small section of it first and see if it meets your needs, then buy the quantity you want. Absolutely. We have a certificate of compliance that our cord is made to Mil-C-5040H specifications and while some colors are not purchased by the Military, all colors are pre-shrunk, even colors like Neon Green or Pink. —The cool trick to help thread your boots with our thicker paracord!—Since our paracord has trouble fitting through very small eyelets, Bill came up with a great idea. 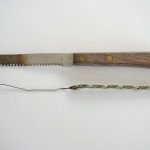 All you need to make this work is a length of paracord that you will use for your laces (give yourself a few extra inches), a paperclip, a pair of pliers, and an old wood-handled steak knife. 2. To classify 550lb (Type 3,) and 750lb (Type 4,) Parachute Cord (a.k.a. 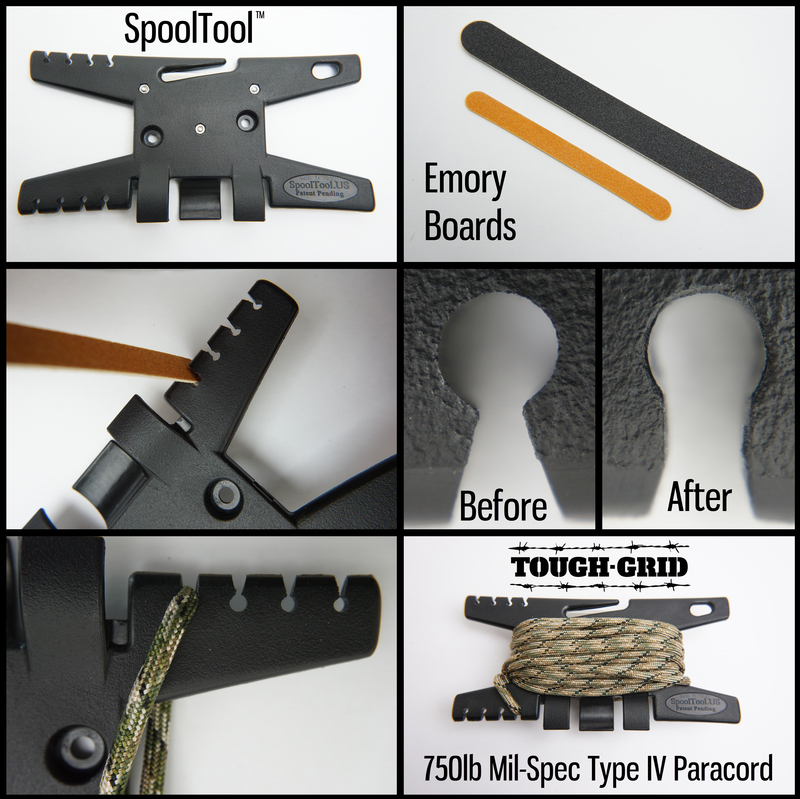 Paracord,) as “Mil Spec”, it must be certified to meet or exceed the standards required by the “Mil-C-5040H” guidelines published by the US Government. 3. 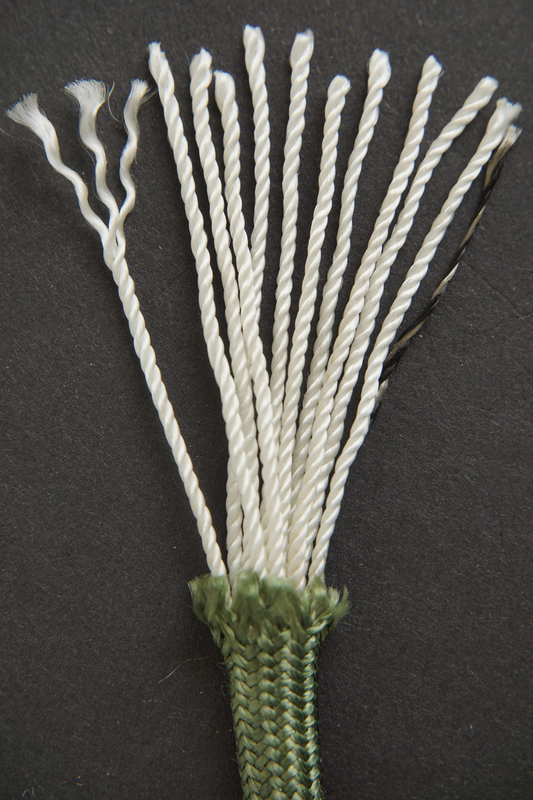 The Mil-C-5040H standards are very specific as to the types of materials to be used, characteristics like: Tensile Strength, UV and Abrasion Resistance, Elongation, Number of Carriers (Strands,) Twisting of Strands, Inclusion of a Manufacturer Marker Strand, and how the paracord is to be constructed etc. 4. Only (2) two colors are called-out or mentioned in the Mil-C-5040H document: “Natural” (meaning White,) and “Camouflage Green,” which replaced “O.D. Green” (Olive Drab,) in 1994. The US Government (Military) routinely purchases these as well as other colors of Mil Spec Parachute Cord not mentioned in the Mil-C-5040H guidelines. 6. When shipping Mil Spec Parachute Cord to the US Government, it must have a very specific type of informational label affixed to the spools of cord, at lengths specified in the Mil-C-5040H document. These labeling, packaging and length requirements do not apply when shipping Mil Spec Parachute Cord to the consumer market.